Section 4: Duelist Kingdom arc (第（だい）四章（しょう） 決闘者（デュエリスト）の王（おう）国（こく）編（へん） Daiyonshō Dyuerisuto no Ōkoku-hen) is a story arc in the Yu-Gi-Oh! manga. Maximillion J. Pegasus forces Yugi Mutou to participate in the Duelist Kingdom tournament. Yugi is accompanied by his friends, including Katsuya Jonouchi, who participates for the prize money to pay for an eye operation for his sister, Shizuka Kawai. Yugi and his friends watch the Japanese Duel Monsters tournament finals on TV, before Yugi opens a package from Industrial Illusions, containing a recording of Maximillion J. Pegasus, the creator of Duel Monsters. Dark Yugi continues to Duel Pegasus through the TV, but Pegasus is able to predict Dark Yugi's moves. Dark Yugi continues to Duel Pegasus through the TV. However, Pegasus claims that the true game has just started. With limited film left on the tape, Pegasus also adds a time limit. Yugi receives his invitation to Duelist Kingdom. Yugi and his friends take the boat ride to the Duelist Kingdom tournament. They meet a number of contestants as they do so. The Duelist Kingdom tournament begins. Dark Yugi tracks down Insector Haga to get revenge for their encounter on the boat. Dark Yugi continues his Duel with Insector Haga, who brings out an army of powered-up Insect-Type monsters. Insector Haga plays "Cocoon of Evolution" in an attempt to evolve his "Larvae Moth" into its ultimate perfect form against Dark Yugi. Dark Yugi and Haga finish their Duel. Katsuya Jonouchi and Mai Kujaku start their Duel. Katsuya Jonouchi and Mai Kujaku continue their Duel. "The Fear of the Sea"
While searching for food, Dark Yugi and his friends are led to Ryota Kajiki. As Dark Yugi and Kajiki continue their Duel, Dark Yugi looks for a way to combat Kajiki's "Sea Stealth" strategy. #73 #14 "The Thief" 盗賊!!? Dark Yugi, Jonouchi and their friends search for a thief, who stole another Duelist's Star Chips. Mokuba explains why he tried to take Dark Yugi's Star Chips and reveals more of Pegasus true intentions. Dark Yugi is later arranged to face the Ventriloquist of the Dead in a Duel. "The Cards Bare Their Fangs"
Dark Yugi battles the "Blue-Eyes White Dragon" Summoned by the Ventriloquist of the Dead. Dark Yugi and the Ventriloquist of the Dead finish their Duel. #77 #18 "On My Own" この手で勝つ! ! "I'll Win With My Own Hands!!" Mai Kujaku arranges for Dinosaur Ryuzaki to Duel Katsuya Jonouchi. Katsuya Jonouchi and Dinosaur Ryuzaki continue their Duel. Katsuya Jonouchi continues his Duel with Dinosaur Ryuzaki. "Flame Swordsman" easily disposes of Ryuzaki's Dinosaurs, but Ryuzaki knows he has a powerful card that can defeat it. "The Man Who Came With the Night"
Mai spends the night with Yugi and his friends. Meanwhile a strange man lurks the area, looking for Duelists. #81 #22 "The Invisible Cards" 見えないカード!! Dark Yugi faces the Player Killer of Darkness, who hides his monsters within the darkness. Dark Yugi reveals his "Swords of Revealing Light" card to the Player Killer of Darkness, which he asserts will defeat the Player Killer in five turns. Dark Yugi and the Player Killer of Darkness conclude their Duel. #84 #25 "A Storm in the Kingdom" 王国に嵐吹く!! "A Storm in the Kingdom!!" Seto Kaiba travels to Duelist Kingdom, having awoken from his coma. Seto Kaiba arrives on the island, where he meets Yugi and his friends, including Jonouchi, who has not forgiven him for what happened in Death-T.
Seto Kaiba and Katsuya Jonouchi battle, using Duel Disks. Kaiba reaches Pegasus Castle, but is refused permission to see Pegasus without 10 Star Chips. While Yugi and Jonouchi prepare for their second day of the tournament, they are spied on by Bandit Keith and his goons. Jonouchi Duels Ghost Kozuka in the Graveyard field. Keith, who has spruced-up Ghost's Zombie Deck advises him against playing Zombies for the first few turns, which initially seems disadvantageous, as Jonouchi's monsters plow through them. Jonouchi struggles against Ghost Kozuka's field of zombified monsters, Summoned by "Call of the Haunted". Meanwhile Yugi, Anzu, Honda and Bakura desperately search for Jonouchi. Jonouchi continues his Duel with Ghost Kozuka. Before Yugi, Jonouchi, Anzu, Honda and Bakura can leave the underground, Bandit Keith has his goons lock them in the tunnels, by rolling a boulder in front of the entrance. The groups search for another way out takes them to the Meikyû Brothers, whom Yugi and Jonouchi Duel in order to escape and gain spots in the finals. Shitō!! Meikyū no Michi no Wana!! "Deathmatch!! The Labyrinth's Unknown Trap!!" The Labyrinth Duel between the team of Dark Yugi and Jonouchi and the Meikyû Brothers begins with the Duelists trapped within the "Labyrinth Wall" while "Wall Shadow" decimates their monsters. "The Magic of the Maze!!" With the "Wall Shadow" destroyed, the Meikyû Brothers use "Magical Labyrinth" to isolate Jonouchi from Dark Yugi. "The Terror of the Dungeon"
Having just Summoned "Black Skull Dragon", Dark Yugi and Jonouchi continue their Labyrinth Duel with the Meikyû Brothers. In accordance with the Meikyû Brothers' rules, Dark Yugi and Katsuya Jonouchi have to choose the correct door in order to leave the maze. Kaiba takes Croquet hostage and demands that Pegasus return Mokuba to him. Having lost to Kaiba, Yugi struggles with how to work with Dark Yugi, while Mai attempts to repay her debt. #107 #48 "To the Castle!" 城へ!! Yugi and Jonouchi enter Pegasus' castle with Mai, where they find Bandit Keith already inside. Kaiba prepares to Duel Pegasus. The final four Duelists ready themselves and Mai and Dark Yugi start their Duel. "Running on the Last Minute!!" After defeating several strong opponents, Yugi and Jonouchi finally reach Pegasus. The time has come to the Duelist Kingdom's final confrontation. The final Duel of the Duelist Kingdom begins. Yugi and Pegasus clash, with Pegasus beginning the Duel in the lead. Pegasus' Millennium Eye allows him to read through all of Yugi's cards and strategies, making him able to counter every move Yugi makes. Pegasus corners Yugi completely by using his trump card - "Toon World". When Yugi seems to be hopeless, a way to counter Pegasus' Millennium Eye shows up. "The Capture of Toon World!!" Yugi and Dark Yugi manage to counter Pegasus's Millennium Eye by constantly switching minds. With Pegasus unable to read though his strategies, Yugi manages a comeback and annihilates Pegasus' Toon Monsters. Yugi seemed to have dominated the Duel, but Pegasus turns it into a Shadow Game, putting the normal Yugi in danger, as he takes the lead once more with his "Relinquished". Pegasus manages to take the normal Yugi out, and tries to corner Dark Yugi with his "Sacrifice Combo" and the power of his Millennium Eye. However, the connection between Yugi's and his friend's hearts allow Yugi to turn the tables using the card his other self left to him. Using the card his other self left to him, Dark Yugi finally manages to defeat Pegasus. The Duel between Yugi and Pegasus is finally settled. 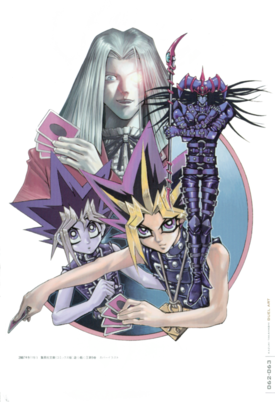 In the aftermath, Yugi and his friends are told by Pegasus about his tragic history. This page was last edited on 16 March 2019, at 14:34.